Racing and Charity, a good combination happening every year at the East Coast Pier Race.// Report sent by Andrew Dowley.--The 26th East Coast Piers race sponsored by Wildwind Sailing Holidays was held over the weekend of 29th and 30th June at Marconi Sailing Club. 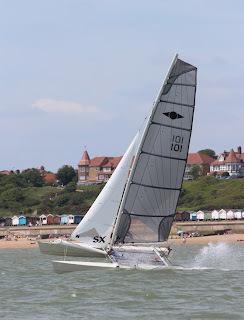 Once again the race weekend was run with the full East Coast Piers Race (48 miles) and the Colne Point Race (27 miles) on Sunday and inshore racing on Saturday. After the introduction of Dinghies for the Colne Point Race last year, fast dinghies were once again invited along. Saturday bought shifty conditions for the two afternoon warm up races. There was a mixture of wind conditions across the course with the shelter of the island providing a difficult balance of wind vs tide for the competitors. The first race course took the sailors up and down the River Blackwater, from the start it was William Sunnucks and Freddie White who led in their Marstrom M20 Vampire. Grant Piggott and Simon Farren were able to keep up enough to claim the race victory on corrected time. In the 2nd race the William and Freddie held the lead from the start again and kept far enough in front to take the victory putting them on top of the table in the Saturday series taking the Cool Cats trophy home. On Saturday night, the majority of competitors and organisers frequented the bar to enjoy the Ghost Ship bitter and Bitburger Lager very generously donated by Adnams. Sunday morning’s ECPR started at 9am with the Colne Point Race starting at 9.20am. The start of the ECPR saw a downwind start with patches of wind across the river. The tide was helping the sailors escape out of the river while trying to get into the patches. The fleet split over different sides of the river to try and find the best breeze. By the time the front of the fleet arrived at Bradwell the M20 Vampire had pulled out quite a lead followed by Pete Jary and Tim Roden on their Tornado. The F18’s of Grant Piggott and Simon Northrop were hot on their tails and were keeping up in the light airs. Further towards the Weymarks/Bradwell gate the breeze was building with 9 knots of wind. This helped the front of the fleet to increase the gap followed by Andy Robinson and Chris Coe who were close to the leaders at the Walton turning mark. As the middle of the fleet were approaching the top of the course at Walton on the Naze the wind was building and gusts of 29knots were being recorded by the mother boats. This made an interesting beat back with the wave height increasing. There were a few swims on the way back but the M20 Vampire took line honours finishing the course in 4 hours and 23 minutes. They were followed by Pete Jary and Tim Roden who were 23 minutes behind. 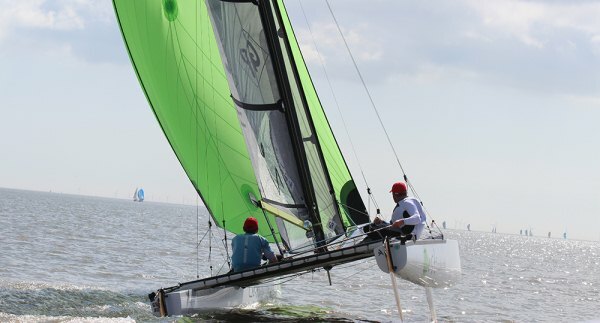 It was Grant Piggott and Simon Farren who took the East Coast Piers Race victory on corrected time, they finished the race in 4 hours and 49 minutes and were the 3rd boat back. In the Colne Point Race Barry Arnison and Nicole Davy were the first back in 3 hours and 9 minutes but that wasn’t enough to hold off Robin Leather sailing his Shadow who won the race on corrected time. In the dinghy race it was Marconi members Mike Taylor and Peter Playle won sailing an Osprey. 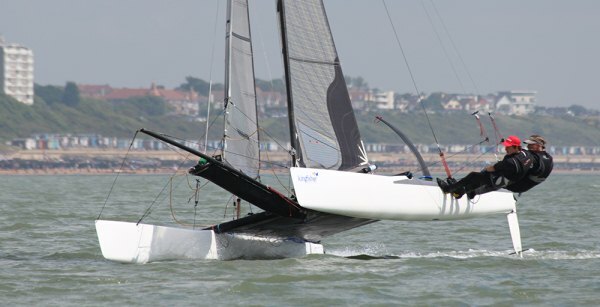 If the results were mixed together with the catamarans they would have finished in 4th place overall. Nick Miller, a Marconi Sailing Club member was the lucky one with the raffle ticket to claim a fantastic Wildwind Sailing Holiday for 2! The top raffle prize is very generously donated by Wildwind who have a sailing school in Vasiliki, Greece. A big thank you to the competitors, sponsors and volunteers who all pull together to make the East Coast Piers Race weekend a great success. This years sponsors are Wildwind Sailing Holidays, Adnams, AM Safety Specialists, Dinghy Rope, Yachts and Yachting, Funky Monkey Boat Names, Brentwood Communications and Design & Post Ltd.
Last year we raised over £14,000 for The Cirdan Sailing Trust while also donating £500 to Essex Air Ambulance, we’ll keep you posted on this years figures in the next few months.